At the start of this year’s CARAT exercises, the recently appointed U.S. Ambassador to Thailand Kristie Kenney took some time away from the capital and visited the Rayong area. Her motorcade first arrived May 19 at 8:30 a.m. at the Chuksamet Pier in Sattahip to board the USS Tortuga where she was given a tour of the ship which has just returned from assisting with humanitarian operations in Japan following the recent earthquake. Herman G. Rowland, the great, great grandson of the founder of Jelly Belly, and Ambassador Kenney talk about how Jelly Belly’s are made. Her Excellency spoke with many of the crew and thanked them for their continuing efforts. 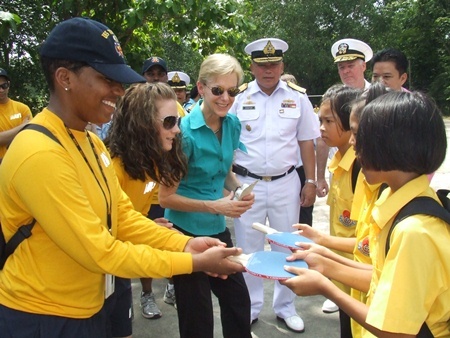 Next the Ambassador and her aides made their way to a nearby community where she was given an insight into the relationship between the US military and Thai citizens. Troops were putting the finishing touches to a basketball court that needed a bit of weeding, a new paint job and new nets. This is done as part of the US Navy’s Comrel (Community Relations) and it’s an opportunity for them to become closer to the needs of Thai people. This in turn builds a bond between them. 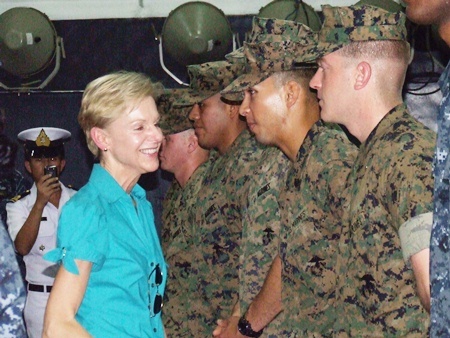 Ambassador Kenney meets the troops aboard the USS Tortuga. A brass band played, “When the Saints go Marching In” to welcome the Ambassador, who handed out basketballs to many of the children. She was then shown how the military assists with medical checkups and eye tests, and were giving away spectacles to those in need who lived locally. From here the delegation were transported to the new Ford manufacturing plant. This facility, due to open next year, is a testament to the benefits of doing business in Thailand. Ford will use a mix of foreign experts and managers, along with a vital Thai workforce and robots. It will have an initial capacity of 150,000 cars a year, the first of which will be the Ford Focus, and will create 2,200 jobs at the plant which sits on about 70 acres. Sailors help Ambassador Kenney distribute sports equipment to local students. The Ambassador was given an overview of the new plant and she said that Ford was now a truly global company, bringing in the best from all over the world to make a product that was once regarded as an American icon. After a brief tour the ambassador was taken for a demonstration on the parking system in one of the Fords on a specially designed area. The US Ambassador to Thailand cheers on the folks at the Ford factory in Rayong. 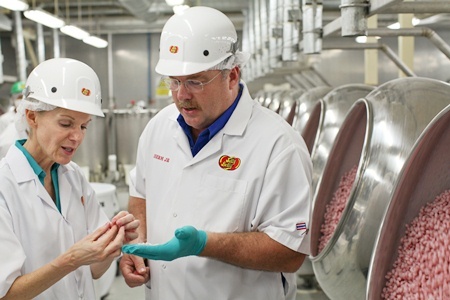 The Ambassador finished her day with some desserts at the Jelly Belly factory where again she was given the hands on tour prior to her heading back to Bangkok. American citizens should note that the US Embassy will hold a consular day in Pattaya on June 1st at the Dusit Thani hotel from 10 a.m. until 2 p.m. Consular services available will include Notarial Services and Certified Copies, passport renewal applications, extra visa pages and questions regarding social security, VA, or other federal benefits.